Are Visas or passports required to take a tour? All passengers booked on a tour must have a government-issued form of identification, no EXCEPTIONS. On what days do tours operate? All of our tours operate 364 days a year. On Christmas Day (25 December), our offerings are limited to airplane and bus tours only. Where are Grand Canyon Airlines' terminals located? Our four air terminals Boulder City, Nevada, the South Rim (near the entrance to Grand Canyon National Park), the West Rim of the Grand Canyon, and in Page, Arizona. From which hotels do you pick up? We offer shuttle pick-up from most major Las Vegas hotels on the Strip and downtown. No. We offer hotel pick-up only. However, a passenger does not need to be staying at a hotel to take advantage of our shuttle services. Passengers that reach the nearest major hotel may be picked up by one of our shuttles. Please contact Reservations to make arrangements at (702) 736-7243 or toll-free at (888) 635-7272. Do your tours pick up from McCarran International Airport? Most tours have multiple departure times ranging from early morning to late afternoon and evening. Can tours be modified or altered? Our groups and incentives department would be happy to assist you in creating a custom tour package for your group. What languages are offered for tours' headset narration? 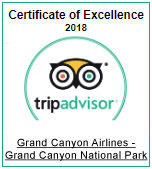 Grand Canyon Tours are offered in: Spanish, German, Russian, Swedish, Portuguese, Italian, Greek, French, Dutch, Thai, Indonesian, Cantonese, Mandarin, Korean, Japanese, and English. What is the recommended attire for a tour to the Grand Canyon? Layered clothing is recommended through the months of March to September as the area regularly experiences hot and cool temperature changes. Winter clothing should be worn from October to mid-March. Sturdy, toe-covering shoes are highly recommended as the ground at the canyon can be rough, rocky, and uneven. Sneakers or hiking boots are highly recommended. Cameras and phones are welcome and encouraged, but please be aware that the use of selfie sticks and extending camera poles are strictly prohibited in and around the aircraft. Such items must be stored until after disembarking at your destination. What is the best method to book a tour with Grand Canyon Airlines? We encourage our customers to book online to ensure they receive the best pricing. However, you may also reserve your tour via telephone at 702-835-8484 or toll-free at 866-235-9422. Am I required to pay in full at the time of booking? Yes. We not accept partial payments or payment for reservations at check-in. Are advanced reservations required or can tours be booked upon arrival? We are happy to take booking on arrival. However, better prices are available online and our helicopter and airplane tours regularly sell out. It is recommended that you book in advance. You will receive an order receipt immediately after booking. This receipt acknowledges that we have received all of the information required and that your credit card was successfully processed. Within 24 hours you will receive your tour confirmation at the email address entered during booking. It has been 24 hours since my booking and I have not received my booking confirmation. Was my booking processed? If you have not received your confirmation (in your inbox OR in your spam folder), please feel free to contact our reservations center. You can find the full details of our cancellation policy here. What is the policy for no-shows? No-show reservations will be cancelled if the passenger has not checked in at least 15 minutes prior to flight time. I have not decided my date of travel. Can I book a tour and leave the date open? I am receiving a credit card decline message while trying to book. What do I do? Our reservation center staff will be happy to help you complete your booking via telephone at 702-835-8484 or toll-free at 866-235-9422. How long should I expect to wait for a response to a special inquiry? Depending on the complexity of your request it could take slightly longer than 24 hours to respond. We do not wish to waste your time with pointless emails and will only respond with emails of substance. If you have an urgent need please feel free to contact our reservations center at 702-835-8484 or toll-free at 866-235-9422. The surcharge is already included in the price of any tour booked online. Is there a surcharge for customers of size? Airplanes and helicopters have a maximum weight capacity as well as other restrictions on that govern the balance of the aircraft. All airplane and/or helicopter passengers will be weighed at time of check in. Passengers exceeding 300lbs (136.36kg / 21.43 stone) will be charged a fee for an additional comfort seat. This fee is based on the product and ranges from $50 to $250. Are discounted services offered for large groups? We have a variety of service programs available for large groups. Small groups can even be booked directly on our website. How do I change the passenger names in my booking? Passenger name changes can be made by contacting our reservations department at 702-835-8484 or toll-free at 866-235-9422. How do I change the date of my tour? Contact our reservations center to make the change in advance or inform your customer service agent upon check-in to the terminal. Can coupons be deducted from the cost of my booking AFTER my reservation has been confirmed? No, coupon codes must be mentioned at the time of booking. Coupons have limited offer dates, expiration dates, or can be based on availability. Can already-confirmed bookings be altered?